Thank you :). I really needed that! It’s so bright and beautiful, and I can almost feel the sun on my face. You’re welcome. I heard about the late winter storm in the Northeast (make that the Southeast in Canada). One reason I went out photographing two days ago and again yesterday is that the forecast for Austin beginning today predicted cloudy skies, and this morning is indeed overcast. We were lucky – that storm stayed south of us. However, I am really sick of being cold all the time. I really need Spring! It’s less than a week to the official beginning of spring, so take heart. On the other hand, I remember snow on Easter Sunday in New York in 1970. One reason I moved to Texas in 1976 is the warmer weather. My hubby’s birthday is on April 22nd, and I remember a few times where there was snow on his birthday. Hopefully there won’t be this year :). Let’s hope not. You deserve springtime warmth. My sentiments exactly~I needed to “feel” the sun on my face as well! Ah, another Northerner. I’ll commiserate with you. 60° in February: that’s a change indeed for such a northern place. I’ll bet you knew it couldn’t last. I did, but then I’m an optimist and I thought perhaps global warming was handing Illinois a gift. It was a gift. Perhaps it’ll become a regular one up there the way it is down here. There’s no month in Austin when the temperature doesn’t at least occasionally rise into the 70s. In fact for most months here you can replace 70s with 80s. The strong red and those subtle blues make a lovely photo! looks like there’s been more cold weather up there — any new frostweed ops?! Happy saturated colors to you down there. We spent a month in New Zealand so I’m not up on what the weather in Austin has been until this past week, but I don’t think the temperature got anywhere close to freezing while we were away. That’s another way of saying no frostweed ice. We did, however, see the ice of a glacier in NZ. I’ll add that a lot of the bananas for sale in supermarkets there come from Ecuador. It’s also nice that New Zealand called you back… that’s what Ecuador kept doing to me until I finally planted my roots here! There’s still so much to see, but that’s a nice problem to have! We probably wouldn’t have gone back so soon after our 2015 visit but Eve’s niece got married on February 11 and Eve and I, as her oldest close relatives, were asked to serve as sponsors. The other bananas we saw for sale in NZ were from the Philippines, which Eve was glad to see. Surprisingly, the “kiwi” fruit for sale at this time of year in NZ is all from Italy, apparently because of the different growing seasons. how great that you were able to support your niece, with a bonus of seeing more of the flora and fauna. ha, kiwi from italy – the world works in funny ways! What a wonderful image! Oh my… seeing this warms my heart so much! This is what Life is about! What a beautiful moment! Thanks for your warm enthusiasm, Lisa. And yes, the Philippines has many varieties of bananas as well. Eve says that the better-tasting ones don’t generally make it to the United States. I bought some little bitty chunky bananas yesterday. They’re called ‘oritos’ here and are sweet, very yellow and very firm. Another kind referred to as ‘cuadrados’ I think, have four angular sides and are not very sweet and do well for cooking. I like to dice and simmer them with cinnamon and limon mandarinas, which has a texture and flavor that reminds me of peach cobbler! Pass the helado, por favor?! You never have to ask me more than once to have some helado. I’m fond of plátanos baked with honey and sprinkled with cinnamon. This morning I’m just finishing guayusa tea brewed with dried stevia, and the platanos with honey and cinnamon sounds like a wonderful way to start the day. I don’t have any ripe ones, but those little orito bananas probably would make a great little orb of banana bread..hmmmm. guayusa has amazing health benefits, and if i drink too much, i start losing too much weight..
Have people marketed guayusa as a way to lose weight? Or maybe the weight loss is particular to you and doesn’t occur with most other people who drink the tea. At an Austin meeting of the Native Plant Society a few years ago I drank some yaupon tea, but not enough for it to live up to the species name vomitoria. Ah, so dried leaves of more than one sort are getting processed in Colorado. Guayusa yields a different sort of Rocky Mountain high. If demand for guayusa keeps increasing, it can’t be long before people try growing it in other countries, just as the cultivation of tea and coffee have spread to countries far from the original habitats. Experiments may already be well under way. Good to hear. Are you aware of any successes growing it outside of Ecuador? a few searches came up with little, but i found an out-of-stock ‘plants for sale’ …. surely there are people cultivating this in other areas…. I see that that nursery is in Santa Monica. I wonder what the demand for guayusa plants is there. The fact that they’re out of stock implies that the demand exceeds the supply, but whether there’s too much demand or too little supply, or some combination, isn’t clear. i think that anyone who drinks guayusa would want to try to grow at least one, just for trivia! at the property on the coast are two moringa trees.. one is pruned back every so oftn to easiy get the leaves… the other grows naturally, near a royal poinciana tree, and it’s nice to see it in flower – pale yellow – and then it goes to seed. the seeds did well in the cloud forest during the dry season, but the little seedlings vanished during the rainy sesason! I see that it’s native to the Himalayas. I also see sites that are promoting the tree as a miracle plant. sí; its benefits are amazing, though aside from people who are ultra attentive to a super-food diet, the moringa seems to be snubbed by many cultures. someone said they worked in Africa, where moringa grew well, but even though people were hungry, they didn’t like the moringa. it has a strong flavor…. many people tell me, ‘i buy powdered moringa that comes from ecuador,’ and they put it in green smoothies…. I found a promotional video from a company that sells moringa products to people in the United States. The video is self-serving, but you can see what you think. that’s good that you tried it and had no side effects! It was just a small amount so I could see what it tastes like. I seem to remember it had a smoky taste, most likely from how the leaves were prepared. That’s a wonderful photo of you and Eve and your niece. Eve’s dress certainly brought back some memories. I had a friend who made homemade notecards by tatting tiny flowers from thread, and then putting them on the cards. She preferred pretty pastel colors, and her flowers looked just like Eve’s. 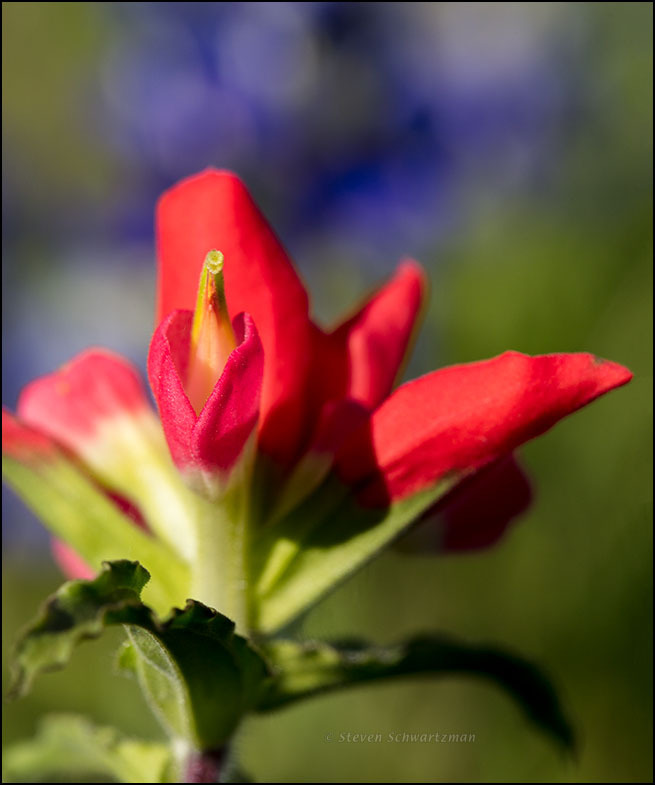 The Indian paintbrush is beautiful. I was happy this year to capture a couple of non-traditional images of the flower, which really profits from a view like this. it’s great that you got those crinkle-edged leaves in, too. It’s good to be able to walk in nature here before the chiggers arrive (although a dewberry cane still wanted at me). I went to a place where I’d seen Indian paintbrushes in other years (even once in the winter), and I wasn’t disappointed. We’d also seen some along US 290 coming home from IAH in Houston a week ago but the weather didn’t cooperate and besides, we were too exhausted to stop. We took Eve’s dress to a dry cleaner today. He recognized immediately that it’s made of pineapple fibers and said he’d succeeded with similar garments. Later he called us and said he hadn’t noticed the flowers, and that it could be risky to dry clean the dress. Eve will get it back and try to clean it by hand. 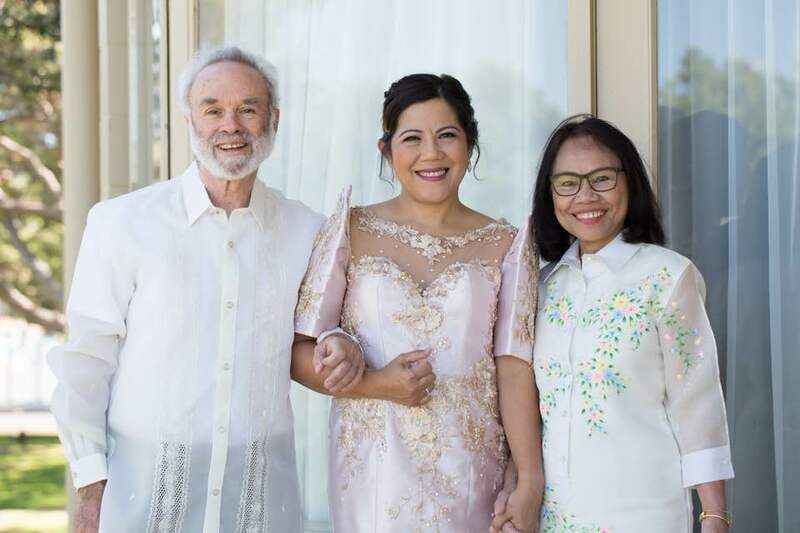 The barong I was wearing in the photograph was a borrowed one that stayed in New Zealand. And yes, we all look happy. That becomes a familiar color combination here at this time of year. I’m looking forward to more. Lovely to see the bright spring flowers but the star photo is the one of you and Eve with your niece. As for bananas, I would agree that the best of the bananas grown in the Philippines and Ecuador don’t reach us in NZ. But the kiwifruit grown in Italy are actually very good, and sometimes better tasting than the NZ ones! Will the NZ government put you on trial for treason for your praise of Italian kiwifruit? Yes, the picture of the three of us turned out well. Eve is normally photogenic. I’m normally not. I see that France, Korea, and Japan are also suppliers to a lesser degree. Yes, but I have yet to see their kiwifriut here. Sigh…no blooming anything here… but daffodils are coming soon. In spite of this photo and the floral one in the following post, wildflowers have been on the sparse side here so far this spring. I haven’t been roaming around a lot, though, so maybe there are some good stands of wildflowers that I’m not aware of. From what I’ve seen on Facebook, Arizona and California are going gangbusters. Part of me was tempted to zip over there, but the rest of me was exhausted from a month of running around in New Zealand. Even now I’m barely back on Austin time. It certainly would be a treat to experience that explosion of color. Jack Dykinga has been posting quite a nice selection of his images from Arizona’s bloom burst. I regret not managing to make my way over there now. A month from now we’ll be driving to Kansas City for another wedding, but there’s no way that area can compare to springtime Arizona.